A lot of people see heat protectant products as unnecessary so they skip application before straightening. This is a big mistake. These products were made specifically to protect your hair from heat damage, and most do their job pretty well. Heat protectant products will minimize the damage your hair endures while eliminating frizz and increasing smoothness. Cleaning your flat iron may not be at the top of your to do list, but it is something that needs to be done regularly. As you continuously use your iron, an abundance of hair product and residue begins to build up. This residue will impact how smoothly your flat iron operates and can lead to your hair getting snagged or burnt. Cleaning your iron with water and rubbing alcohol should be more than adequate, or you may choose to buy a cleaning product specifically made for flat irons. 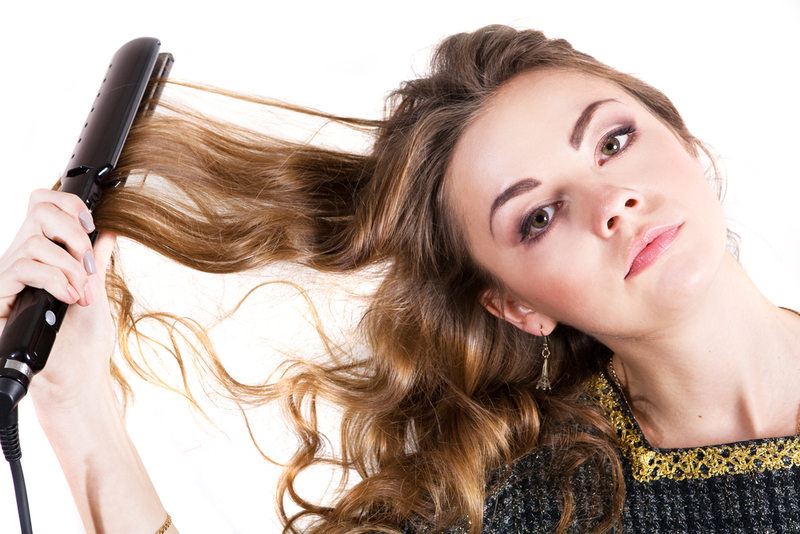 To avoid having straight, but flat, hair, stop pulling the iron down when you straighten. Hair looks better with some volume. This can be achieved by pulling your hair up and away from your head while you are straightening. It may sound logical to avoid higher heat levels so you don’t damage your hair, but using a setting that is too low may actually do more harm than good. A low temperature means that you will likely have to run your iron through the same piece of hair over and over again to get the desired effect. This puts you at the risk for damage and is simply inefficient. A medium to high setting will save you time. Just because your iron can crank the heat up to 450 degrees doesn’t mean you should do it. The highest setting on most irons was designed for professional use (the kind you get at our Dublin hair salon). This temperature is much too extreme for home use and will likely damage your hair. You may have to do some experimenting to find the right heat for your hair. Starting at 300 degrees and working your way up is a safe bet. Don’t just grab a handful of hair and start straightening. You should split your hair into sections so you can work more efficiently. If you do not section your hair, you can end up suffering damage from trying to iron a portion that is too thick, or ironing the same piece of hair multiple times. Give yourself two clear sections to work with by splitting your hair in the middle at the back and bringing it forward. Don’t immediately throw your hair into a bun or ponytail after straightening. You hair needs time to set and breathe. This should only take a few minutes. When your hair is cool to the touch you are free to wrap it up. If you hear a sizzle or smell burning, stop immediately! You are obviously doing some real damage to your hair. It is not something you should just “push through.” Make sure that your hair is completely dry and that your iron is clean. You may also want to lower the heat level of your flat iron. Avoiding these mistakes will leave you with amazingly straight, healthy, and sleek hair. If you want more tips, stop by Threads Dublin Hair Salon or make an appointment to see us.